Photo by T.G. Barnes, University of Tennessee Herbarium. With its bright crown of tubular flowers and sweet minty scent, it's easy to see why this show staple of the summer garden is attractive to so many pollinators. 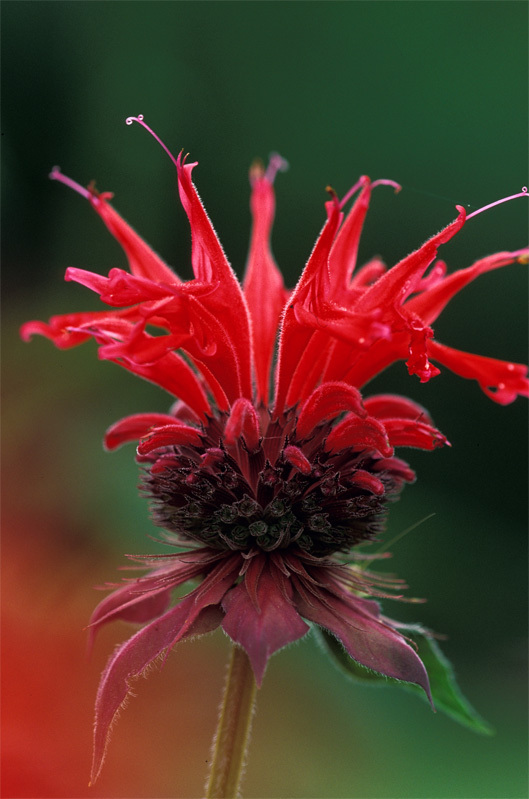 The genus Monarda, commonly known as Bee Balm, represents 16 species of plants in the mint family (Lamiacea) and is widespread in North America with several species native to Pennsylvania. 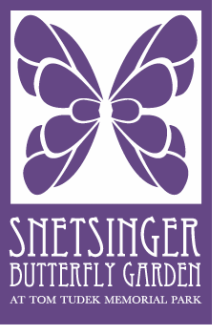 Three varieties are commonly found in our area, and are easy to spot at SBG when they bloom in large attractive stands. Shown above, this variety is found in our Pollinator Demonstration garden and is particularly attractive to hummingbirds due to its red color. 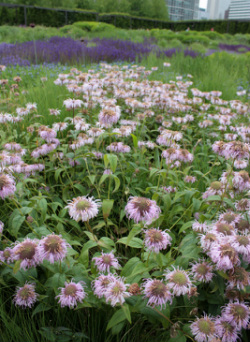 It is often sold in garden centers and nurseries as the cultivar 'Jacob Cline' - which is just as attractive to pollinators, but has a shorter growth habit and can become "leggy"
Also known as wild bergamot, M. fistulosa balm can be found along several of the pathways in the meadow and distributed throughout the habitat. Forming clusters of flowers ranging from light pink to deep purple - it is frequently found as cultivars in nurseries. A large stand of M. clinopodia can be found towards the rear of the pollinator garden. White bee balm readily forms large stands. The species can tolerate partial shade, is slightly more drought tolerant than other species, but can be susceptible to powdery mildew. The flowers have a slightly more citrus scent than M. fistulosa and M. didyma. Native to southern regions and parts of the midwest, M. bradburiana is notable for it's low growth habit and shade tolerance. Growing to only 2 feet high, it can from dense clumps in full sun to part shade. The shorter flower bracts make allow the nectar to be more accessible to short-tongued bees such and is frequently visited by bumblebees. Garden where it is grown as an annual.